Wario can't be bothered to make games any more, so he's going to let you create them for him. Design and program your own microgames and share them with friends. 9-Volt's set of microgames are all based on other Nintendo games. Based on Super Mario Bros. (NES). Use the on-screen buttons to move Mario left and right and avoid the hopping Paratroopa. Based on Super Mario Bros. (NES). Avoid the Spinies. Based on Mario Paint (SNES). Colour the picture to appear the same as the finished picture. 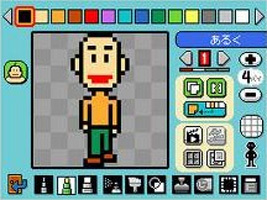 Based on Mario Paint (SNES). Tap the flies to clear them. Based on Super Mario World 2: Yoshi's Island (SNES). Pound the ground by tapping twice. Based on The Legend of Zelda: Phantom Hourglass (DS). Attack the Chuchu enemies as they approach from all directions. Based on Metroid (NES). Avoid the enemy and collect the item. Based on Star Fox (SNES). Defeat the enemies. Based on Pikmin (GameCube). Time the moving target to throw the Pikmin onto the nectar. This microgame replaces the "Murasame Castle" microgame in non-Japanese versions. Based on Wii Play (Wii). Pop the balloons in the Shooting Range. Based on Wii Fit (Wii). Balance the Mii on the tightrope using the on-screen Balance Board. Based on Big Brain Academy (DS). Touch the image that matches the moving silhouette. Based on Mysterious Murasame Castle (NES). Make Takamaru invisible to avoid the enemy attacks. This microgame only appears in the Japanese version. It is replaced by the "Pikmin" microgame in other versions. Based on Ice Climber (NES). Collect the eggplant. Based on Balloon Fight (NES). Tap to make the Balloon Fighter avoid the sparks. Based on Excitebike (NES). Destroy the obstacles in Edit mode. Based on Urban Champion (NES). Punch the opponent when he stops blocking his face. Based on Greenhouse (G&W). Shoot the insects with your bugspray. Based on Turtle Bridge (G&W). Move across the bridge when the turtle's head is out of the water. In the Record Maker, you can select a Famicom/NES instrument set to play 8-bit sound effects. Drum SFX represented by Cheep Cheep from Super Mario Bros. Drum SFX represented by Bullet Bill from Super Mario Bros. When listening to records on the Player, you can also randomly play sound effects, and four of them are from Nintendo games.